Hoax is maybe too strong a word, but for Gulf Coast gardeners, it might as well be a hoax. Save yourself some disappointment and grief and go to Growing Irish Potatoes to learn how to really produce potatoes in our climate. 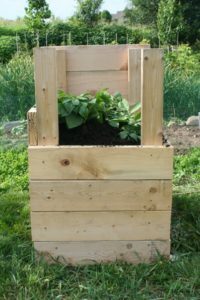 "Grow 100 pounds of potatoes in 4 square feet! !” I see this every year in garden magazines, websites, blogs, and social networks. And I get calls and emails asking me about it every season. They all stem from an article that was posted almost 10 years ago in the Seattle Times. How-to's are everywhere, and there are even commercial "potato towers" available in catalogs. They are touted as space savers and high producers. Problem is, almost none of them mention the fact that potatoes, like their cousins tomatoes, are divided into determinate and indeterminate varieties. The tower system will ONLY work with indeterminates. You can go to YouTube and see dozens of clips of people excited to empty their tower, tall trash can, bin or barrel of potatoes. With great anticipation the grower will spread a tarp out in front of their tower, eager to post their harvest of a bushel basket of spuds. At best, they will unearth a few potatoes of varying sizes. At worst, they will find marble sized tubers that have never full developed. "UPDATE: After two years experimenting with these, we're abandoning this way of growing potatoes. Very poor harvest both years. With wood up the sides, the potatoes are hard to keep uniformly moist. Potatoes did not form up the stem as they were supposed to. We only found them near the bottom. With chicken wire sides, the plants had better access to sun and water, but we still had a poor harvest - tiny tiny potatoes. We're going back to regular raised beds." I feel for them. After reading the hype, and seeing all the pictures, it seems that just anyone should be able to pull this off. It must be so disappointing. You can often hear them on their videos questioning "what did I do wrong?". It's not them, it's the seed potato they used, and the fact that the info about growth habit was never mentioned. The videos usually end with the gardener making a promise try again and to do better next year. They just might do better, but only if they happen to get their hands on an indeterminate variety and they live in a climate where the variety can thrive and produce. The varieties that do well in our area are ALL determinates. They are early to mid-season varieties that set their all of their tubers in a relatively short window of time. They will NOT continue to produce layers upon layers of potatoes in a 3' tall tower, bin, or barrel. In fact, if you hill them too deeply, you will kill the plant and find a mere handful of tiny, underdeveloped tubers, if any at all. The problem is, getting the information about growth habit is not as easy as it should be. Every tomato you see will be identified as determinate or indeterminate on the label, and/or in the catalog, but I have never seen potatoes that declared the habit on the package or in the description. Nurseries and feed stores are not well-prepared to furnish this information because their suppliers are not well-prepared to furnish it! I have been told all kinds of things. I had one willing and eager clerk call the supplier while I waited. The supplier did not know for certain, but they made an educated guess. Internet searches have returned conflicting information on some varieties - reporting the same variety to be a late season on one site and as an early season variety on another. There are also widely varying descriptions of days to maturity from site to site. I decided that I have to have multiple confirmations of growth habit and days to maturity to accept it as valid, and I give more credibility to southern resources like the University of Florida. Even then, I will be open to changing my own notes if I find that one consistently demonstrates a conflicting characteristic. Any plant can have one bad season. The varieties that are available at our local independent nurseries and feed stores are all determinates. They are NOT suitable for Potato Towers. They are short season varieties, also called early to mid-season. Stick with these dependable varieties for your main crop. Plant them at normal depths and hill them just enough to cover any emerging tubers or use a pine straw or hay mulch to do the job. If you want to experiment with a long season variety in a tower just for fun, by all means do so. In a good year with perfect conditions, you just might pull it off. Be sure to plant these as soon as temperatures cool down in late October or November because they will need a long, cool season to have any chance at all.